Quad Core 64-Bit FPU PowerPC with Two Virtex-7 FPGAs and 8 high speed ADCs/DACs. PowerPC runs U-boot, GNU/Linux, BLAS, and LAPACK. Interfaces include PCIe, Gigabit Ethernet, RS-232/RS-422, USB, and SDHC. Typically controlled via Ethernet using a SCPI-like protocol. Twenty Eight 10 Gbps SERDES directly connect the FPGAs to the backplane, supporting 280 Gbps duplex communication in each direction. Low Latency Baseband Filter-Equalizer includes two time interleaved 400 MSPS 14-Bit ADCs and six 2.3 GSPS 14-Bit DACs with on-board full dynamic range anti-aliasing filters and RF loopback. First prototype baseband board shows 90+ dB isolation in 20 MHz to 300 MHz passband up to 400 MHz, 60+ dB isolation up to 3 GHz can be improved by changing anti-aliasing filters or RF loopback. Typical uncalibrated performance shows -50 dBc image rejection, 0.7 dB 6.7 nS peak to peak flatness. Calibrated performance is <-80 dBc image rejection, 0.1 dB 0.2 nS flatness. 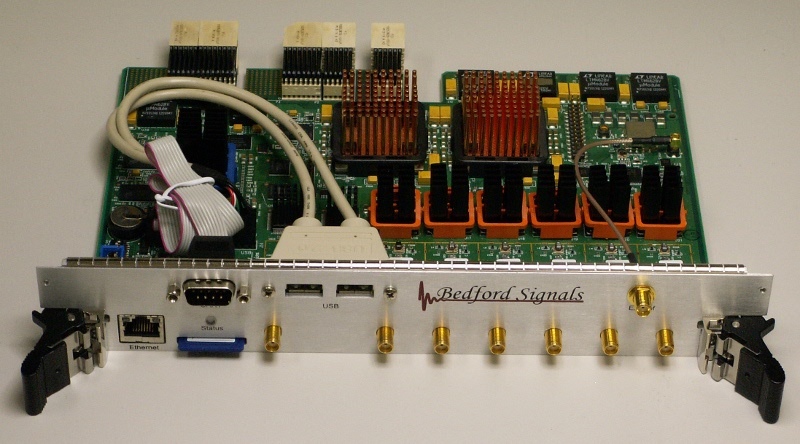 Spurs include <-60 dBc ADC harmonics, <-60 dBc DAC SFDR, <-80 dBFS unrelated digital spurs. Custom CompactPCI Serial Backplane Provides Full Mesh High Speed Serial for up to nine System Cards. System SPI Controlled Variable Voltage Supply for Fan Speed Control.